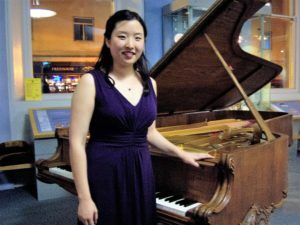 Sunderland Pianoforte Society started its 74th season with a recital given by Jinah Shim, a young pianist who was sponsored by Making Music’s Philip and Dorothy Green Award for Young Concert Artists scheme. An enthusiastic audience was treated to an interesting programme which was beautifully played . The evening began with the Schubert Sonata in A, Op.120 and was followed by three impromptus, Op.90 nos.2,3,4, all played with great sensitivity and style appropriate to the period. After the interval we heard the Fantasie in F minor, Op.49 by Chopin followed by a powerful performance of Ballade No.2 by Liszt. The recital ended with L’isle Joyeuse by Debussy which was clearly enjoyed by both pianist and audience and made a very good start to the season. Jinah Shim began learning the piano at the age of five and was a winner of the European Piano Teacher’s Association competition in 2005. She then went on to study at the Birmingham Conservatoire as a junior student where she won many more prizes. Notable past performances include Grieg’s Piano Concerto in Birmingham’s Symphony Hall, Rachmaninov’s 2nd Piano Concerto and Mozart’s Piano Concerto No. 12. As well as solo playing Jinah is interested in Chamber Music and has performed with her own Piano Quartet, the Hill Piano Quartet. Making Music is the UK’s leading organisation for voluntary music and the Society appreciates the financial help which enables us to present such talented young pianists. This entry was posted in Recitals, Reviews and tagged Chopin, Debussy, Liszt, Schubert on 22/09/2016 by David.